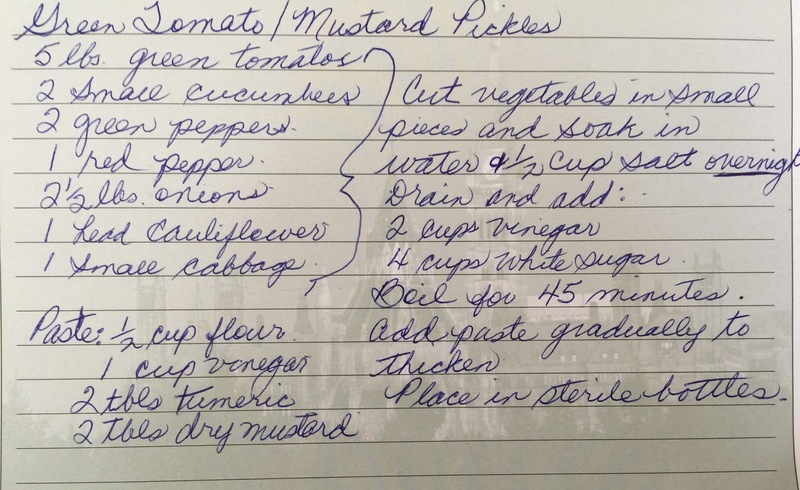 Our ongoing quest for mustard pickle recipes continues. First up is from Jason Sellars, who writes, "This recipe comes from my mom and is made annually by the case from ingredients grown from her vegetable garden in Winter Tickle, Newfoundland. Try finding that on a map, I dare ya! Way better than any store bought." Cut vegetables in small pieces and soak in water and 1/2 cup salt overnight. Add paste gradually to thicken. Next we have a recipe from Sheila Cooke, who writes, "This is my late husband's recipe with comments (in parentheses)." After standing time passes, drain well and rinse well using sieve. Boil 20 minutes, stirring constantly. Seal in sterilized pint jars. Let sit in jars at least 1 month before using--if you can wait this long. Enjoy! Place clean, prepared veggies in crock. Cover with brine solution. Let stand 24 hours. Make dressing: mix dressing ingredients thoroughly and cook until thick. Stir in pickles and heat thoroughly, BUT do not let cukes get soft.